If you're looking for forklift parts in Los Angeles then there's only one name you can trust that has a reputation of quality service, Hyundai Forklift ofSouthern California. 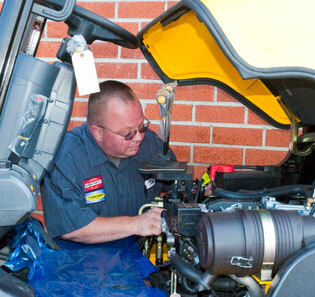 Since 1947, this trusted business has been supplying forklift parts to Los Angeles area business. When you need top quality forklift parts to buy then you need Hyundai Forklift of Southern California. Check out our large inventory of forklift parts for Hyster, Nissan, Clark and Toyota. Success - it's all about providing forklift service our customers in Los Angeles can rely on. That trust was built upon a Los Angeles forklift service company supplying superior products, topnotch technicians and quality repairs. At Hyundai Forklift of Southern California, our large staff of experienced in-house/radio-dispatched forklift service technicians is highly proficient at repairing or maintaining any kind of forklift . . . regardless of its size. They should be. Each one has an average of 20 years experience. That means when you get forklift service in Los Angeles from us, it's not only fixed, but it fixed right. When you are looking for a forklift rental in Los Angeles, there is only one company to turn to, Hyundai Forklift of Southern California. We can handle you short, medium and long-term rentals. We have gas, lpg and electric forklift of all sizes to supply the forklift rental needs of our Los Angeles customers at any time. You never know when you will need a rental or a couple of forklift rentals in Los Angeles.